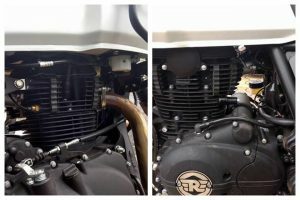 Royal Enfield recently launched the BS4 compliant tourer which is the Himalayan BS4 with Fuel Injection technology. The Himalayan BS4 will be available for approx. Rs. 1.94 lakh (on-road, Pune) according to RE dealers. Furthermore, the company has started delivering the BS4 version of Himalayan to dealerships for test-rides. Probably, deliveries of the RE Himalayan BS4 will begin by the first week of September. The dealers are accepting the bookings of Himalayan for an amount of Rs. 5000/-. The Himalayan is the first adventurer tourer Royal Enfield motorcycle launched in India. It was one of the most awaited bikes in 2016. Royal Enfield launched the Himalayan BS3 in 2016 with carburettor engine. However, there were some issues regarding clutch and gearbox in the first batch of motorcycles. Also, to comply with BS4 emission norms the company stopped the sales of the BS3 version of the Himalayan. Thus, the sale of the BS3 version has been very low in the first quarter of 2017. 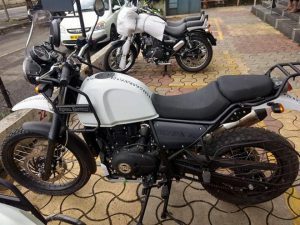 What’s in the new Royal Enfield Himalayan BS4? The Himalayan BS4 gets major technology upgrades in the engine and also some minor changes on its exteriors. The new Himalayan gets its power from a 411cc, BS4, fuel-injected engine with an O2 sensor. This engine produces 24.5 hp of power and 32Nm of torque which is mated to a 5-speed gearbox. In addition, the Himalayan also gets some styling changes which includes blackened handle bar clamp and fuel filler cover. 41 mm telescopic fork at the front and a mono-shock with 180 mm travel at the rear carry out suspension duties on the motorcycle. For braking, there is a 300mm disc, 2-piston floating calliper at the front and 240mm disc, single piston floating calliper at the rear. The bike has highest ground clearance of 220 mm in the segment and a seat height of 800 mm. Find more information about Himalayan BS4 here.